Our 20-hour Business English course gives you the basics you need for teaching the most popular of ESP courses. You will be in demand! This Business English course was written by our Academic Director, who has an MBA and real world international business experience and has taught Business English in Korea, Taiwan, Saudi Arabia and Thailand. Each chapter in the coursebook is written in PPP/ESA type format and is easily converted into a first-class Business English lesson. This certification course demonstrates the use of function-based lessons that are critical for your success when teaching Business English. Business English students are quite different from typical language school students. They are often older, more experienced and tired from a long day at work and have a definite idea about what they want and need to learn. You'll need to know what you are doing if you are going to teach Business English. They are often required to take English classes if they want to progress in their company. If you are seen as being "wet behind the ears" and as having little or no knowledge of their world, you will typically be replaced rather quickly. 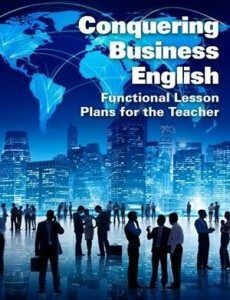 Some EFL teachers think that teaching Business English is the same as teaching regular English classes but with a little business vocabulary thrown in. Some teachers think that all you might need to do is to change The book is on the desk to The report is on the photocopier. That is not good enough. These older, more skilled business people also need you to have some interest and knowledge of the business world. You would be expected to pique their interest and create relevant contexts for your lessons. The coursebook for this certification will lead you to those special topics that are relevant to these more demanding students. Students and employers will often pay you 50-100% more than other EFL teachers are paid for these types of courses. Experienced teachers can expect this course to take about 20 hours including the lesson plan project. New or inexperienced teachers should expect it to take longer. Your evaluation is based on submitting a lesson plan on a topic of your choice within the bounds of teaching Business English. Business English is all about teaching functions lessons rather than the grammar-based lessons that CELTA or other TEFL courses teach and that Business English students hate. This course comes with your Business English coursebook, our Successful Presentations eBook and our Fast Track Grammar Review for EFL Teachers. Teach Business English! You'll be glad you did.